This machete is heavy duty and stands up to repeated hard use. It is heavy, but it performs heavy duty chores that a lighter blade may not be suited for. I would recommend this to anyone who is looking for something to replace their hatchet. It looks cool and boosts testosterone! Elicits comments of “Survivor Man is better than Bear Grylls!” from strangers. *I have recently been informed that Gerber issued a recall notice on this machete. 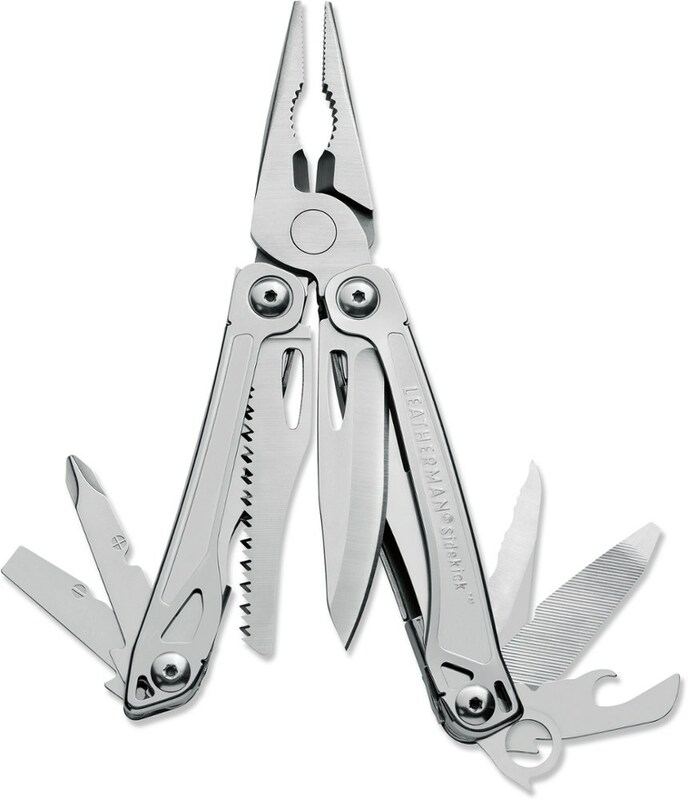 I've had no issues with mine, but I've gone to the Gerber website and notified them (step 1 of having it replaced). If you buy one of these second hand, please look into it and ensure that you don't have one of the older recalled models. 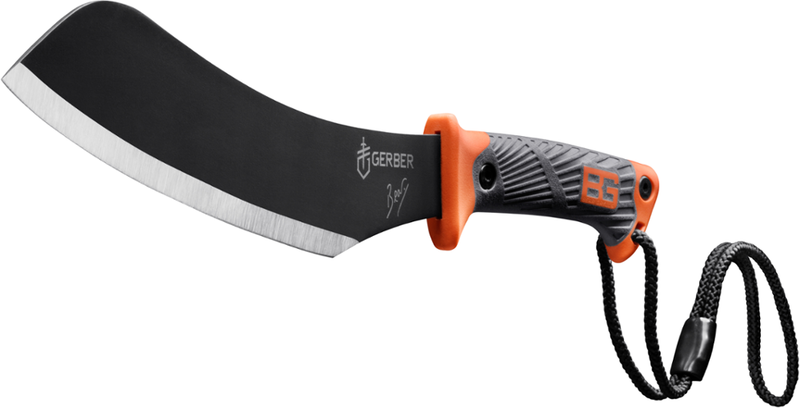 ** I notified Gerber and they sent me a carton to ship them my machete. Then they mailed me a new one. No cost to me, but it took 6 - 8 weeks. All in all, I had no problems with my original machete, and after a year of use, they replaced it with a brand new one. Thanks Gerber! I bought this blade two summers ago. I was looking for something smaller than an axe. I hate hatchets and refuse to use them, because they are (IMO) one of the most dangerous pieces of kit out there. Most people carry a hatchet because they want something smaller and lighter than an axe to carry in to the back woods. The problem with that plan is that hatchets are extremely dangerous, and are mostly used when you are miles away from cars and phones and emergency rooms. Hatchets aren't expected to split giant logs. They are used for splitting smaller logs. This hatchet can do that. I use mine to split wood using the baton method. It's that safest way I have found and I don't have to worry about driving a hatchet into my thigh or my knee. I just place the machete edge on the log, and whack it with a large stick. Most logs are split easily with only a few whacks. When you get accustomed to splitting wood with a machete and baton, it's amazing how hard it is to watch someone else swinging a hatchet around. I cringe and get out my first aid kit every time I see someone doing it. Another thing I love about machetes in general is that they were designed for cutting down 1 to 3 inch thick trees and branches. 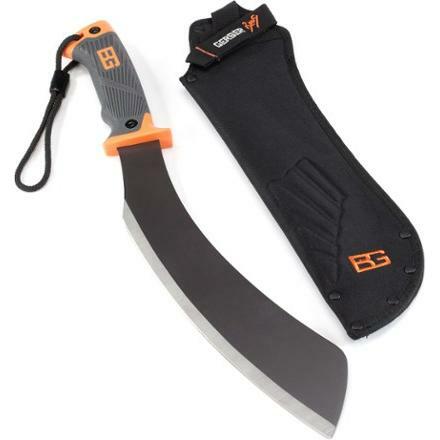 As a survival tool, a machete will assist you to cut the wood necessary to build an emergency shelter or an emergency stretcher in a few minutes. Way faster than a saw, and much safer than an axe or hatchet. And in a non-emergency situation, I've used it similarly to cut wood to build a shelter, a bench, a rack for hanging wet clothes on, a platform to keep our packs off the wet ground, and to dig small holes (for grey water pits and cat-sanitation). Machetes work great when they are sharp, and work almost just as great when they are dull. When you're whacking a 2 inch thick piece of wood with a steel machete and a full arm swing, it's going to go through every time, whether it's sharp or dull. The sheath that this machete comes with is fabulous. 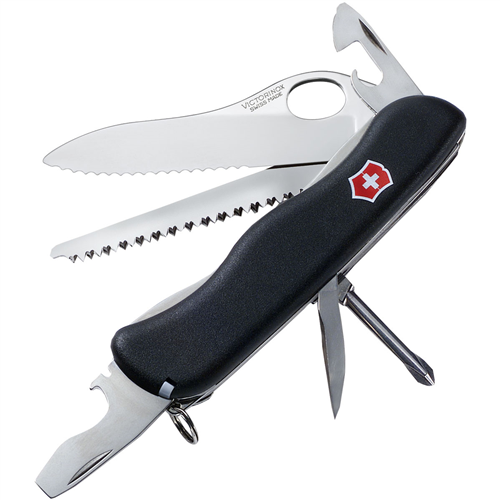 It covers the entire blade, so that there are no sharp edges to come into contact with any of your gear. The sheath also locks the machete in place so securely, that you literally CANNOT pull it out of the sheath if it is placed in it properly. This means that if your sheath is secured to your pack or your person, you will not lose your machete, no matter how you are running, tripping, or tumbling through the bush. The grip on this blade is very grippy and mine has never slipped out of my hand (even when wet). It's comfortable to hold and easy to grasp. The rope loop on the handle is meant to be threaded over the grip and acts to prevent your fingers from slipping forward and contacting the blade. It isn't meant to loop over your wrist like a wrist lanyard. Yet ANOTHER reason to buy this item is that it's hard to not feel like a big tough jungle guy when you’re swinging a machete. When you pull this baby out of its sheath, you'll hear a collective gasp from the other campers in your party. You may even hear a collective gasp from the forest critters in the general vicinity. Birds will stop chirping. Crickets will stop rubbing their back legs together (I think that's how they make that sound...). 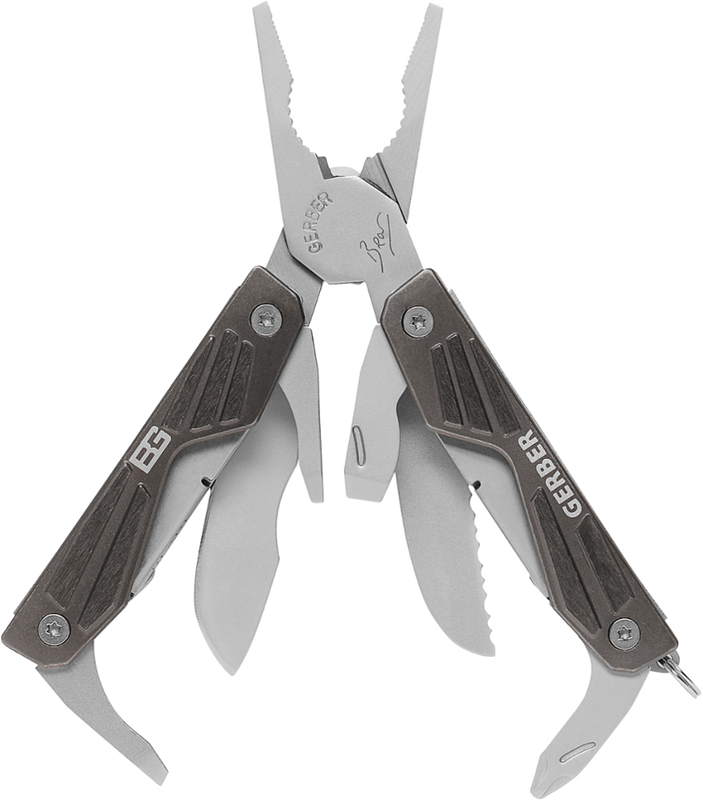 Deer, coyotes, and humans alike will freeze in their tracks as they wonder "who is this big tough burly bush-man, and what is he going to do with that impressively built Gerber brand instrument of woodland destruction?" You will hear a loud sigh of relief when they see that you have only drawn it from its scabbard to safely split some kindling, or to cut off a piece of kubasa for a snack. The weight. It's heavy! If you put it on your belt, your pants are going to fall down! You'll be tripping down the trail with your pants around your ankles! And after preaching about the safety of machetes vs. hatchets, it doesn't make sense to put yourself in a situation where you are stumbling headfirst into a creek because you strapped a machete to your hip. I strap mine to my pack. The belt loop is nice and wide, but I would have loved if they would have designed a loop or a grommet at the bottom of the sheath to make it easier for me to strap it to my pack. I usually sit it into a pouch or compartment on the side of my pack, and run a compression strap through the belt loop. However, I would rather be able to positively secure it to 2 points instead of one. "And in a non-emergency situation, I've used it similarly to cut wood to build a shelter, a bench, a rack for hanging wet clothes on, a platform to keep our packs off the wet ground, and to dig small holes (for grey water pits and cat-sanitation)." All superb examples of the "Leave no Trace" policy. Be aware that there was a recall on this product by Gerber. 5pike, thanks very much for the info. I wasn't aware that there was a recall. schifferj I understand and agree with "Leave No Trace" policy, and I practice it when I'm in provincial and national parks. However, I loved practicing bushcraft and survival skills as a kid in the boy scouts, and I love teaching it to my own sons. That's why the majority of our excursions are on privately owned bushland and remote crown land. There's no need to leave sarcastic, snobby comments to my machete review. If you don't like it, just move on. But just out of curiosity, if you have a problem with me moving 50 meters off the trail, digging a small hole, and pouring my grey water (dirty dish water consisting of biodegradable soap bubbles and some food particles) into the hole then covering it back up, then how exactly do you dispose of your grey water? Ridiculously sharp replacement for your machete and hatchet! Although a bit bulky and heavy for what it is, it is in fact a replacement for a hatchet and a machete. The angle of the blade and balanced weight makes cutting limbs or trees a breeze. I have even turned it on its side to hammer tent stakes and shelter posts on a lean to. 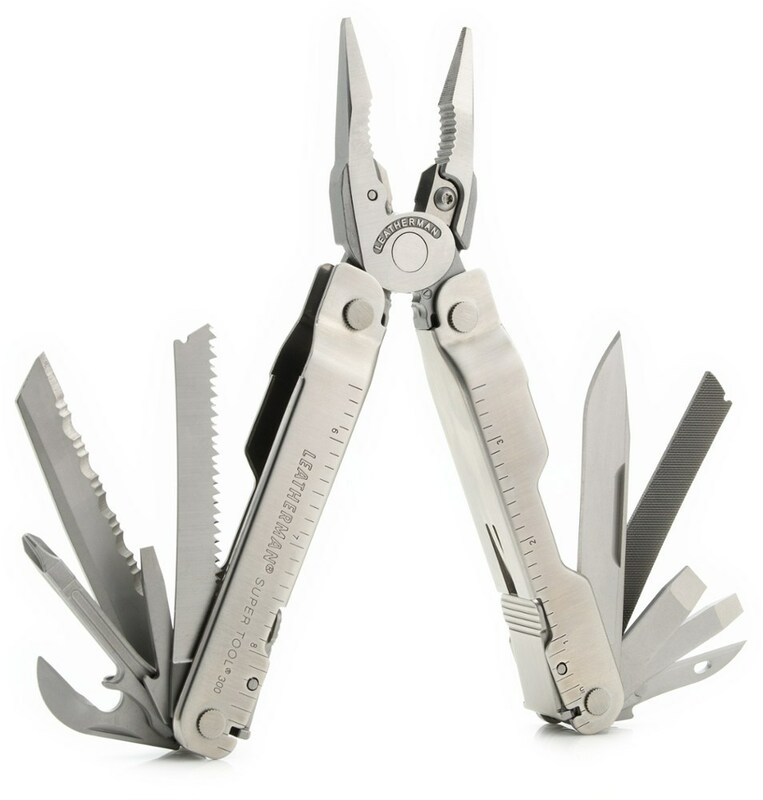 It is a great survival tool and a great addition to my pack. 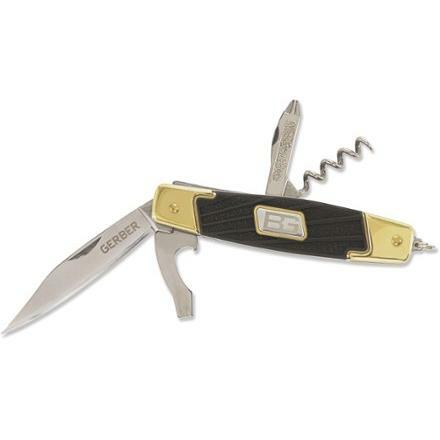 The Gerber Bear Grylls Parang is not available from the stores we monitor. It was last seen August 31, 2017	at CampSaver.com.